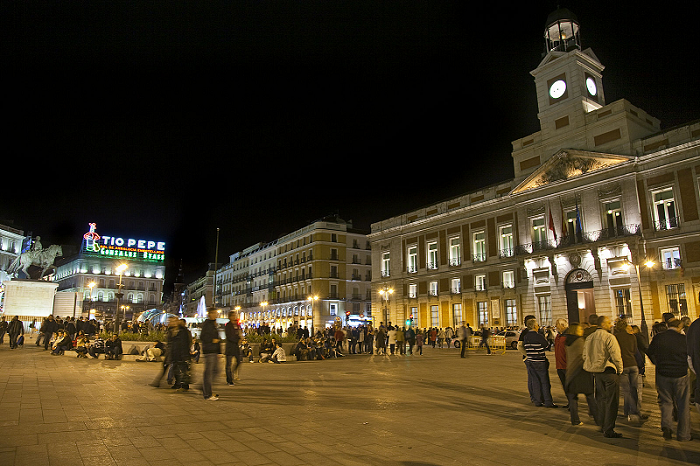 If there is a traditional square in Madrid, that is Puerta del Sol. It is the heart of the city. Its name originates in the sixteenth century. At that point was one of the doors of the city wall that was the first to receive the sun’s rays every morning. Hence, the Emperor Carlos I of Spain and V of Germany gave him the name of “Puerta del Sol”. The clock is another attraction of this square. It is a tradition to welcome the new year to the sound of its chimes. But the current one is the third in the series. The first was located in the Buen Suceso church, which no longer exists. However, it was very inaccurate since it only had one hand. When the aforementioned church was demolished, another was placed in the so-called Government Building, which is the current name of the Royal Post Office that today is the headquarters of the Presidency of the Community of Madrid. However, that watch, while still quite sophisticated, was still very inaccurate. Finally, a new watch was ordered from José Rodríguez, a famous watchmaker who dedicated three years to making the watch that we can admire today and which was installed in 1866. In Puerta del Sol we also find the famous statue of “Bear and the Madroño”, symbol of Madrid. Until the thirteenth century the statue representing the city only included a bear on four legs, without any tree to accompany it. The reason is that the madroño symbolized an agreement that was reached between the City Council and the Church in relation to the control of hunting. In the center of the square is the equestrian statue of Carlos III. Despite its appearance is a very modern statue, since it was erected in 1993, in recognition of the work of the King in the city. So, Carlos III is also known as “the best Mayor of Madrid”. Another famous statue of the Puerta del Sol is the “Mariblanca”. It is the only remaining part of a monumental fountain located in front of the disappeared Buen Suceso church. As for what he represents, nobody is sure. Some say it is about the goddess Venus. Others say it is the goddess Diana, but in Madrid it is known as the “Mariblanca” because of its color. The one that can be admired today is a replica, since the original is in the nearby Casa de la Villa. And we can not fail to mention the famous announcement of “Tío Pepe”. Although it is not something very old, since it was installed in 1935, it fell deeply among the people of Madrid and the visitors, who recognized it as an essential element of the square. Therefore, when the owner of the building where it was located communicated its intention to withdraw it definitively, a popular mobilization was organized in which 50,000 signatures were collected in order to maintain the announcement, as it finally happened. And you know, after admiring our beloved Puerta del Sol, come to El Anciano Rey de los Vinos to taste the most traditional atmosphere in Madrid.